Athletes from Takini, C-EB and Tiospaye Topa packed up their gear and traveled to Huron, SD this past weekend for the DOC. 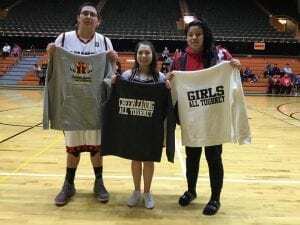 The DOC, or Dakota Oyate Challenge, Tournament took place Saturday, Jan. 24 – Jan. 26 at the Huron Arena. This year marks the 31st annual boys’ tournament, and the 26th annual girls’ tournament. 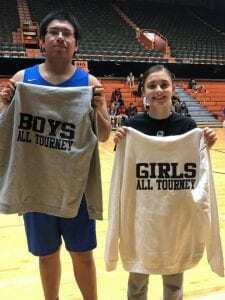 The tournament grew to host as many as 16 boys’ and girls’ teams, but that proved to be beyond Huron’s capacity, and is currently held to 8 teams for boys and girls. The tournament, although smaller than LNI, includes a three-point shoot-out and free throw competition, as well as competitions for cheer squads, handgames and archery. Students all had the chance to attend a College Career Day, and all participants were recognized at a grand entry held on Saturday of the annual event.